By now, there is probably not a person in the world that hasn't seen "the kick." What kick? The one that Holly Holm landed to the side of Ronda Rousey's head that effectively brought an end to Rousey's reign as a UFC champion. Within seconds of the kick landing the haters began to come out online. In the hours and days since the fight ended the haters have come out in droves to make fun of the former champ. Many called her names, said she deserved it, called her a bad person, and generally made fun of her. The hate got to be so strong online that Holm and even Floyd Mayweather started telling people to back off. Rousey hasn't lashed out at the haters or even commented on what people are saying about her. All she has done is say thanks to her supporters and that she will be back. However, if she had wanted to talk trash this would have been the perfect thing to say: Go ahead and hate people. I still got paid—a lot! Not only did she make a ton of money, but what she made for getting knocked out dwarfed what Holm made for knocking her out. The UFC doesn't publicize the contract terms that it has with fighters so the best we can do is estimate what anyone makes. We do know that Holm made $50,000 for the fight of the night, another $50,000 for performance of the night, and a $30,000 bonus from Reebok. From there the best we can do is estimate/guess. In the past Holm has made $25,000 to show and another $25,000 if she won. Many of Rousey's former opponents made $100,000 to show and would have received another $100,000 had they won. Holm's management team had a Rousey clause included in her contract to make sure she was properly compensated if/when she fought Rousey. So, assuming that she was offered what Rousey's past opponents made she cleared upwards of $330,000 for her win. As for Rousey, exact numbers are harder to come by for her, but we do know that she also gets a generous cut of the pay per view take. As of this writing, insiders estimate that Ronda's total earnings for the night will easily top $5 million! For her February fight against Cat Zingano (UFC 184) estimates have her earning a cool $1 million. Of that money $65,000 was to show, $65,000 for the win, and $50,000 for the performance of the night. The remaining $870,000 had to come from her PPV cut (whatever it is). PPV numbers for UFC 184 were reported to be 590,000 PPV buys. Her estimated purse for UFC 190 (Beth Correia) has been reported to be as much as $5 million. Of that $70,000 was to show, another $70,000 for the win, $50,000 for the performance of the night, and a $40,000 bonus from Reebok. The PPV buys for UFC 190 topped out at 900,000. For Rousey to make $10 million at UFC 193 she must get a pretty nice cut of the PPV money. She received $75,000 to show, $50,000 for the fight of the night bonus, and $40,000 from Reebok. These numbers are only unconfirmed reports right now, but if they are even close to what she actually made then she didn't do half bad for someone who got her behind handed to her. She is the highest paid fighter on the UFC roster so maybe those numbers are not hard to believe. 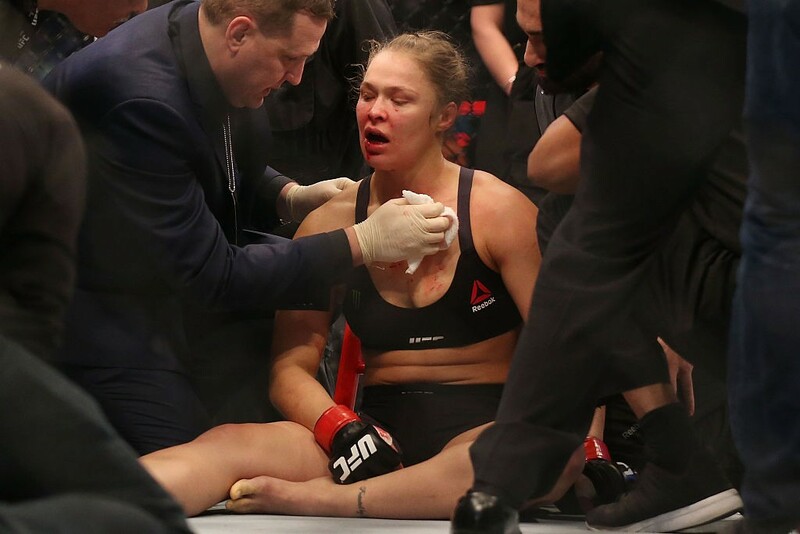 It's been almost a year since Rousey lost in a stunning bout with Holly Holm. But the word on the street is she's been training hard, and she's going to come back better than ever! Together, the women on this list represent $124 million in salaries, endorsement deals, prize winnings, and other assorted sources of income.